Find My Workspace lists over 95% of the business centres market in Bristol. Simply click Request Quote to check pricing for one office, or Add to Basket for multiple offices. This centre is a collaborative deskshare space located on a cobbled lane in the heart of Bristol’s creative quarter, Stokes Croft. Surrounded by other independent businesses it is a perfect location for fledgling enterprise and business collaborations. The contemporary studio is light, spacious and well-finished with an array of facilities, tailored to the needs of freelancers and small businesses. Next door is Howkapow’s main storage and distribution hub, which provides logistics and e-commerce services to local businesses. These services are also available to residents of this centre at a discounted price. Desks can be rented on a full-time, part-time or occasional-use basis. 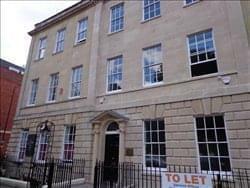 Based in central Bristol, this landlord run, contemporary building offers a tenant only and free of charge fully equipped gyn that is equipped with showers and changing rooms, bike racks and fitness studio. The centre also has a fully manned reception, where warm and professional staff can meet and greet clients and visitors, and the friendly onsite management team are on hand to make your day as easy as possible. The space is first-class, with a great finish, quality furnishings and beautiful design. The space also has a fully fitted kitchen, two 8-person meeting rooms, fully cabled desks and lots of comfortable breakout space. 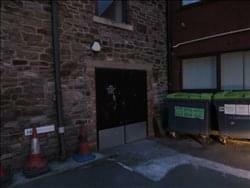 The space also has air conditioning, daily sandwich deliveries, and 40mb fibre internet. Modern and recently refurbished office space available in a detached building. With a range of six offices differing in size to suit your needs and flexible terms and rates from 2-6 desks or optional storage usage, this space is perfect for any aspiring, thriving business. With plenty of amenities at your beckoning, you can enjoy communal kitchen facilities, IT support, toilets, showers, 24-hour access and security, administrative support and post sorting. Take advantage of the meeting areas if you want a break from the office and enjoy the food and drink services on site to keep you refreshed throughout the day. This centre is located in the heart of the vibrant Paintworks area, home to some of Bristol’s great eateries, including Bocobar and the Tube Diner. Using green energy to reduce its carbon footprint and to maximise sustainability, this property will have a BREEAM ‘Excellent’ rating. The property will be accessible to tenants 24-hours a day, perfect for those who want flexibility in their working hours. The building features a buzzing events and exhibition space that hosts a multitude of events, everything from vintage fairs through to festivals. There are other fantastic on-site amenities including showers, meeting rooms, break out areas, a super-fast broadband/WiFi connection and printing facilities. 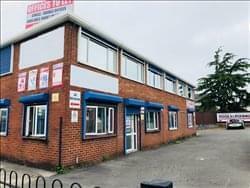 Located on the outskirts of Bristol, this centre has two separate entrances for tenants to make use of, and has a range of office units available, varying from 200 square feet up to 2400 square feet. All units will have access to a loading bay, and on top of this, a goods lift – a real plus point for certain kinds of businesses. The space is ideal for light industrial businesses or those in the creative industries. Units can have their own water supply and toilet facilities, as well as access to communal areas. Parking is available at an extra cost too. Flexible terms are available and tenants will be responsible for their own business rates. This centre offers your own office on the 2nd floor of a shared building with your own kitchen, intercom and identity. This stunning Grade 1 listed Georgian property in Portland Square was purchased and fully renovated back in 2014. Since then, space has been rented out to other companies on the 2nd and 3rd floor. There are 2 meeting room areas which have been tastefully decorated. The location is ideal because it is so convenient for access to the M32, Cabot Circus Bristol’s vibrant retail quarter and just a 15 minute walk to Temple Meads train station. VAT is not charged on the price for this centre so if you are not eligible to claim back or are not VAT registered then this is in your favour. The centre boasts a wide range of amenities including: meeting rooms; a modern refurbished interior; non-branded offices where you have the opportunity to add your own; a kitchen; showers and bike storage, perfect for those who like to cycle to work; and an on-site management team. On top of this, rates and utilities are included in the price and short term contracts and flexible options are available. Newly opened desk space, hot desks, and offices in the heart of Bristol. Two minutes’ walk from Cabot Circus, five minutes’ walk to Bristol Bus Station, and just off the M32, this space is perfect for anyone looking to work in the buzz of Bristol. Desks are going at £80 per month and include all bills so there is nothing more to pay. The workspace benefits from super fibre internet, 4G coverage on all major networks, free tea and coffee, free meeting space, and lockable storage for every desk. Access is 24/7 so you can come and go as you wish and there is off street parking at the building for a fee and super cheap parking on street. The building also benefits from free bike parking. If you are looking for a launching pad for your business or need a place to work remotely look no further than this light and bright historic office space. To obtain information for your selected Bristol Business Centres, please tick the "Add to basket" box for each office you prefer and complete the form below. We will then send a detailed report via email.